Former Real Boston Rams striker Dominique Badji made his debut goal count as it snapped a season-opening 361-minute scoreless streak for the Colorado Rapids in Friday’s 4-0 win over FC Dallas at Toyota Stadium. Inside of two minutes, Badji one-timed a cross from Dillon Powers on right to give the Rapids a lead they continued to build as the game progressed. 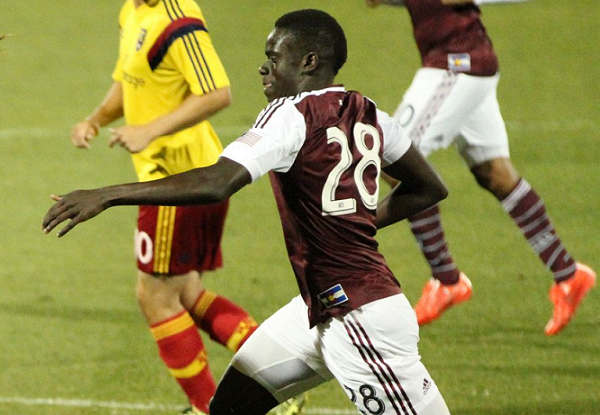 Badji’s strike also helped end the Rapids’ winless skid at 18. Badji, 22, was drafted by the Rapids in the fourth round (67th overall) of the 2015 MLS SuperDraft. He scored twice for the squad during the preseason, and assisted on Colorado’s opening goal against the Revolution on Feb. 21. The speedy forward spent last summer with the Rams, where he scored a goal and added an assist in six matches with the squad. Badji attended Boston University, and was named 2014 Patriot League Offensive Player of the Year following an eight-goal, four-assist season with the Terriers.